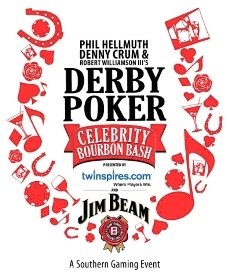 Southern Gaming Magazine announced today via press release that Thoroughbred Charities of America (TCA) has been selected as one of two charitable beneficiaries of the Derby Poker Celebrity Bourbon Bash, sponsored by Jim Beam and Twinspires.com. The party and poker tournament will be held on Thursday, May 1 at the Olmsted in Louisville, Ky. and will be hosted by Hall of Fame coach Denny Crum and poker professionals Phil Hellmuth, Jr. and Robert Williamson, III. Louisville-based Blessings in a Backpack has also been selected as a beneficiary. Kentucky Derby week and horse racing fans should enjoy this event. Formally known as the Derby Poker Championship, the event has become a must-attend Derby party that attracts an array of celebrities, athletes, jockeys, poker professionals and race fans looking to kick-off the Derby weekend in-style. The all-inclusive event offers guests a variety of bourbon themed food stations, sampling areas, premium open bars, a celebrity poker tournament and Jim Beam’s Party Lounge, an area featuring a dance floor, seating and a premium bar. Jane Seymour (Actress), Jennifer Tilly (Actress), Ron White (Comedian), William Fichtner (Actor), Vicki Gunvalson (Real Housewives of Orange County), Nora Roberts (Best-selling author), Oscar Nunez (Actor), Warren Moon (retired NFL Player), Corey Pavin (Pro golfer), Troy Hanson (Indy Car Driver), Bob Guiney (The Bachelor), Ken Davitian (Actor), Scot Pollard (NBA Player), Jennifer Elise Cox (Actress), Robby Albarado (Jockey), Corey Lanerie (Jockey), Chris ‘Jesus” Ferguson (Poker pro), Antonio Esfandiari (Poker pro), Phil Laak (Poker pro), Layne Flack (Poker pro), Josh Arieh (Poker pro), Tiffany Michelle (Poker pro), Dan Shak (Poker pro), and Beth Shak (Poker pro). Tickets are $100 thru April 1, $150 through April 25 and $200 thereafter. The poker tournament is open to the public with a buy-in of $550 and includes full access to the rest of the event. Tickets and poker buy-ins can be purchased at derbypokerchampionship.com. The event is produced by Southern Gaming and Destinations, the South’s largest regional gambling magazine that also specializes in promotions, events and marketing for the gaming industry and is a division of Louisville-based Bisig Impact Group.